In Love for No Reason, transformational expert Marci Shimoff offers a breakthrough approach to experiencing a lasting state of unconditional love—the kind of love that doesn’t depend on another person, situation, or romantic partner, and that you can access at any time and in any circumstance. This is the deepest and truest form of love and is the key to lasting joy and fulfillment in life. Like her New York Times bestselling book Happy for No Reason, this compelling and life-changing book draws on cutting-edge scientific research, ancient, time-tested wisdom from cultures across the globe, interviews with 150 experts (Love Luminaries), and practical, proven tools and techniques. 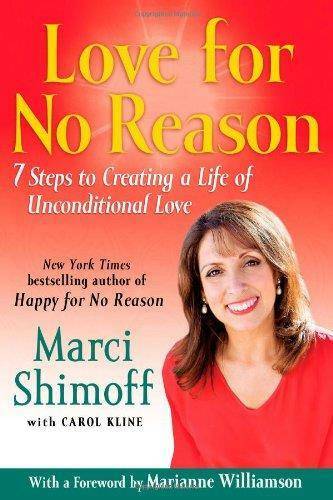 Love for No Reason provides a revolutionary 7-step program that will open your heart, make you a magnet for love, and transform your life. You’ll learn how to: Open your heart fully and experience a profound and lasting love from the inside rather than needing to get it from the outside Bring more love to your family, friends, community and the world without overgiving and burning out Feel unconditional love for yourself and stop beating yourself up, criticizing and condemning yourself. Turn off your body’s stress response and activate the physiology of love to improve your health and well-being. Make your romantic relationships more fulfilling. Experience more success and satisfaction at work. Respond with love even to the things that you find most challenging in your life. Break through the boundaries that block love’s flow—including past negative experiences, limiting beliefs about love, judgments and self-doubt. Connect to that state of unconditional love inside that will make you naturally more loving and draw more love into your life. This is love at its highest and best – it’s what people want most deeply and it’s what the world needs most urgently. Whatever your experience of love is right now—whether you’re in pain or feeling great—you can learn to love at a higher level starting today!